Sit back and enjoy the grandeur of the Canadian Rocky Mountains while floating on the magnificent Bow River, this trip is perfect for any family. This leisurely river float offers excellent opportunities to view Beaver, Elk, Osprey and more! Enjoy close up views of the Three Sisters Mountain and some of the tallest peaks in the Rockies' front range. There is an excellent selection of lunches available if you get hungry afterwards. This trip is perfect for families or anyone looking to relax and enjoy what nature has to offer. A short nature stop allows viewing of wildflower, plants and an opportunity to take some pictures. Twilight tours can offer great alpine lighting and increased wildlife activity. 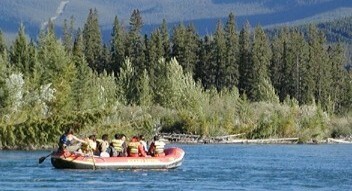 Your experienced river guides will share information on the Bow Valley's natural and local history. 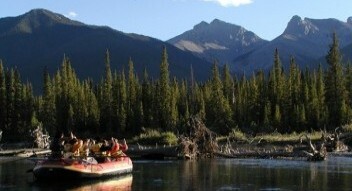 This is the ultimate experience to escape the crowds and get upfront and personal with the beautiful Rocky Mountains! Trips depart daily at 6:00 pm from Banff (Free transportation) or meet at our Canmore office at 6:30 pm for free transportation.